However radical their stylistic innovations, great artists do not spring without precedent from the head of Zeus. More so than many of his peers, Richard Diebenkorn (1922-1993) tried out many approaches in his eclectic quest for a distinctive aesthetic fingerprint. That journey, the painterly equivalent of a cinematic “origin story,” is the subject of “Richard Diebenkorn: Beginnings, 1942-1955,” a five-stop touring exhibition that began last October at the Crocker Art Museum in Sacramento. What is most remarkable about the show is its efficiency in illustrating the young artist’s rapid evolution and relentless pivoting between figuration, landscape and abstraction, all of which would continue to inform his mature painting, including the “Ocean Park” series that ultimately secured his renown. During this period Diebenkorn grew adamant about avoiding even the suggestion of a natural referent in his paintings. The west wall of the current exhibition’s middle gallery demonstrates this aversion in dramatic fashion. Along the broad expanse, six untitled paintings from 1948 and 1949 show a progression from tightly constructed compositions to looser, more expansive abstractions in which space opens into planes of muted color. Paintings from his 1949 “Sausalito” series evince further a burgeoning sense of place and light, a strategy that grew more prevalent after the artist moved to New Mexico in the early 1950s to attend graduate school. “Untitled (Albuquerque)” (1952) is a response to his seeing the desert landscape from an airplane, the earthy palette referencing the sands, sagebrush, and mountains of the desert southwest. In the horizontal canvas “Untitled” (1952), passages of maroon are excavated, revealing pentimento-like striations of opaque color beneath. Surface was important to Diebenkorn even as an emerging artist; his brushwork is ambi-directional and unselfconscious, never tentative. After a brief and unsatisfying teaching stint in Urbana, Illinois, he returned once again to northern California and became a full-time artist. A voracious reader of critical theory and a ravenous consumer of visual information, he programmatically barraged himself with metaphysical and pictorial ideas as a means by which to find a true and lasting voice. Images of Spanish cave paintings inspired “Urbana #2 (The Archer)” (1952), which he marked with his own handprint in vivid red, a nod to the prehistoric artists who “signed” cavern walls with pigment-smeared palms and fingers. The exhibition concludes in the mid-1950s with “Untitled (Horse and Rider),” its elementally rendered equine and human subjects blending in chromatically with the blue and ecru sky behind them. This is representation but not realism: more than a little awkward, unconvincing as a depiction of motion and kinetic energy, more successful as a blueprint or diagram of forms in space. In this estuary where AbEx, landscape, and the human form commingle (a territory explored par excellence by Willem de Kooning, whom Diebenkorn greatly admired), the artist’s die was cast. Even in the implacable geometries of the “Ocean Park” paintings he would commence in 1967, the air and earth and sunlight, and the traces of we who move through them, are never far afield. The exhibition telescopes thirteen years of development elegantly and with a sense of the inexorable. 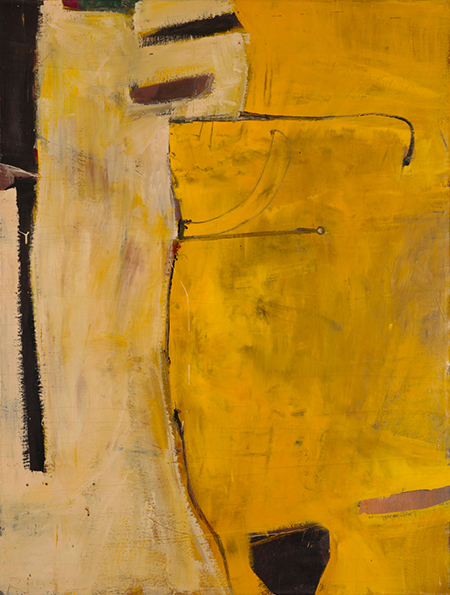 Diebenkorn’s trajectory shows that with time, talent and ambition, committed artists can pour their panoply of influences through a stylistic sieve and wind up with something golden lingering in the mesh — pure, unalloyed and uniquely their own.